Objectives: Students will review the five kinds of lines (horizontal, vertical, diagonal, diagonal, & zig zag) & two kinds of shapes (organic & geometric). They will gain knowledge of the art and history of the Yoruba people of Nigeria & the Senufo people of Côte d’Ivoire, West Africa. Students will learn how to create a grid. Plan a design of a Adire Eleko cloth and a Senufo animal using the animals of West Africa and drawing with oil pastels. Explain that this project will be done in two parts, the background & the foreground. 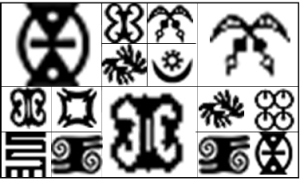 Power Point Lesson on Adire Eleko Cloth showing examples. Adire is the name given to indigo (blue) dyed cloth produced by Yoruba women of south western Nigeria using resist dye techniques. Adire translates as tie and dye. The dye-resistant paste can be either painted freehand or stenciled onto the fabric. When freehand painting, the artist usually paints a grid of squares or rectangles onto the fabric first. Then they paint these squares with geometric & symbolic motifs. They used lines & shapes to create patterns (Rhythm). The cloth is then dipped into a natural blue dye again and again until the cloth is a deep blue. The paste is scraped off to reveal the designs underneath. The cloth is then used as a wrap around one’s body. 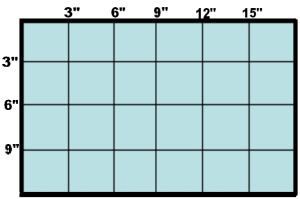 On a 12×18 sheet of blue-green paper, use a ruler to draw a grid that is approximately 3×3”. In each grid use a white oil pastel to draw a African designs/symbols. You can outline some of the grids if you want to. When designs are drawn, paint over sheet with Indigo paint (mostly blue liquid watercolor/a few drops of india ink). Fun to watch the resist happen. If you choose to use this lesson or repost it (written or photos), please link back to my blog Create Art with ME.